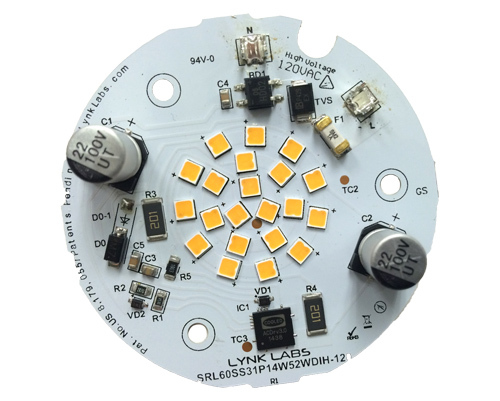 Technology | Lynk Labs, Inc.
Lynk Labs and its technology is responsible for pioneering the AC LED industry segment within the Solid State Lighting industry. The company’s founder and lead inventor Mike Miskin starting out demonstrated how driving LEDs with AC could be advantageous from a cost, size, reliability and infrastructure compatibility perspective. For many years Lynk faced ongoing resistance from the industry arguing that semiconductors are DC devices and should only be driven with constant current or constant voltage DC sources. Lynk continued to pushed on and develop more products, technology and intellectual property around AC LED and unique DC LED technologies. Today Lynk Labs offers the broadest and most diverse offering of technology and intellectual property in the AC LED space comprising approved and pending patents in the field of AC LED lighting core Circuits, Chips, Packages, Assemblies, Drive Methods, Drivers/Power Supplies, Lamps and Lighting Systems. Lynk has also developed and patented other novel LED technologies in the field of displays (TV and PC Monitors for example) and wireless power technology. More information on Lynk Labs products and IP can be found under one or more of the following Patent numbers. What is AC LED Technology? The existing global infrastructure for powering light sources in general lighting runs on AC voltage in one form or another - not DC. Lynk Labs patented AC LED technology eliminates the complicated electronics needed for powering LEDs and simplifies the process of integrating this new lighting technology into the existing AC powered lighting infrastructure. The definition of AC LED technology includes LEDs driven with low voltage or high voltage (often described as HV LED), directly to the LEDs with some form of current limiting, or rectified and can include other simple or more complex methods of current limiting and power conditioning based on the design and application requirements. In the end, AC LED really stands for a design that does not use the conventional, more complex and bulky DC design approach requiring constant current or constant voltage DC power supplies. Although DC LED designs offer value over AC LED in certain designs and applications, AC LED is much more cost effective and infrastructure friendly for the general lighting market as the entire world of lighting, since the invention of the light bulb has been built on AC voltage sources. Lynk Labs AC LED technology and products include AC LED packages, lamps, assemblies, drivers and system solutions for general lighting. Lighting designers and luminaire manufacturers are faced with many challenges when developing LED lighting products for general lighting applications. How to power them and easily integrate them into the existing lighting grid was one of the most complicated, costly and time consuming challenges the industry faced early on. Lynk Labs envisions this problem early on before LEDs even started to make any real progress in the general lighting market and has been innovating intellectual property based products and solutions since then. Contact us to learn more about how AC LED technology can benefit your products by offering a direct AC voltage drive solution that simplifies and improves system cost, assembly, integration, reliability, thermal management, weight reduction and lighting system scalability.